Hi everyone. A few weeks back I did some experimenting with Alcohol Inks and cling wrap. Seems that this is technique is very popular right now. I dropped AIs onto Yupo paper (can't remember the colours, but looks like turquoise, lime and blue). Then I squirted a little bit of blending solution to get the inks moving. I took a piece of cling wrap (larger than the piece of Yupo I was working with), crunched it up to create creases, then opened it up and placed it over the wet inks, crunching the cling wrap a bit more to create lots of folds. I left it to dry overnight. When I removed the cling wrap, this is the background I got. Makes for a very interesting background or die-cuts. I'll definitely be making more pieces with this fun and easy technique. 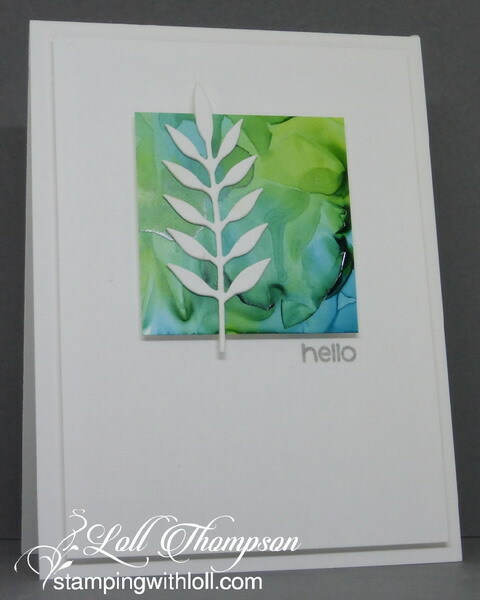 Sharing this card at Simon Says Stamp Challenge - Anything Goes. Wow, I love this, Loll! More AI gorgeousness and another fun technique to try out. Hope you are having a nice weekend. Classy and elegant Loll, love the background! Oh Wow, Loll, I must try this, I can definitely see the folds, this is really amazing! Ohhh wow Loll love this look, beautiful card. Another beautiful alcohol ink creation! I just love the fluidity of your gorgeous background Loll! Wow, this is simply stunning Loll! I love all the backgrounds that come out of your hand. All are amazing. You have a unique eye for color mixing :-) Your card is incredibly beautiful! I do get a thrill seeing the results of these techniques, Loll, whether you do them or I do. Wow! Beautiful colors and movement of the inks, Loll! I love that the simple leaf adds interest without covering much of that gorgeous background! These colors are stunning and the pattern they made is lovely. What a fun technique. Wow, another beautiful card! Thanks for sharing. Oh my goodnes, this background is stunning! Wow! I remember using cling wrap several years ago, but I don't think I ever got into alcohol inks. But boy oh boy, you create some of the most beautiful backgrounds I've seen. You also showcase your dies and stamps wonderfully with them. Just so inspiring! Thanks so much, Loll! Patient lady, but it truly is gorgeous. Love that colour combo too. This turned out beautiful, Loll! The vivid colors are a terrific backdrop for the white die cut! I've seen others do this technique but this is one of the best! Absolutely stunning, Loll. Will have to try the cling wrap (I've seen videos)soon! Love how you always get a perfect blend!! Love the color combo! Thanks so much for playing Simon Says Stamp Wednesday “Anything Goes” Challenge! Beautiful colors and design. Well done! Yes I have seen this version of the AI on Yupo technique. Yours came out beautifully! Great colors! One of the loveliest AI / cling wrap backgrounds I've ever seen. Beautiful colours! WOW, you make the most beautiful bgs for your lovely dies, Loll!!! The colours on this one are sooooo beautiful!!!!! A wonderful CAS card!!! One stunning card Loll - love the background piece. What a gorgeous background! Love your color choices, and interesting look to the technique! This is gorgeous. I like the result of the look of the ink! Beautiful Loll! You have the touch for this technique for sure! Such a beautiful effect with your AI's, Loll! I love your color palette and your CAS design is just perfect to show it off! Another gorgeous card!! !